September 2017 Born in the small Romanian city of Iasži in 1933, Sorel Etrog rose to fame in his adoptive country of Canada, though he remains too little known abroad. To some audiences there, he is above all the author of somewhat cheeky public sculptures; to others, the director of the critically acclaimed experimental film Spiral, 1974, which led to a collaboration with Marshall McLuhan on the 1987 book Images from the Film Spiral. But no matter from what angle Etrog’s life and career are examined, they reveal the artist’s remarkable tenacity. 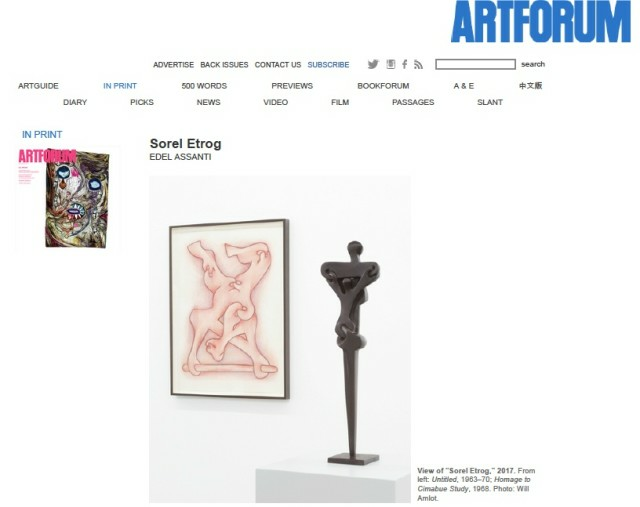 Having survived the Holocaust, Etrog moved with his family to Israel in 1950, where he took his first steps as an artist before gaining a scholarship to the Brooklyn Museum School in New York. He moved to Toronto in 1963 and lived there until his death in 2014. Although most of his sculptures, at first glance, seem abstract, there is a strong relationship between Etrog’s forms and the human body. In Mother and Child study, 1975, a small-scale bronze work, the two protagonists seem to be made of hinges, yet their embrace is a clear reference to the Hodegetria, an iconographic depiction of Saint Mary holding a baby Jesus by her side. On a nearby wall, Portrait of Eugène Ionesco, 1968, showed a dark-blue profile—the silhouette of the Romanian-French playwright, with whom Etrog collaborated—against a black background, the absurdist writer’s visage composed from a painful-looking tangle of wrenches. Hinges and locks were a recurring motif in Etrog’s practice in the 1970s, and this show, titled “Sorel Etrog: Doors open from the inside only,” focused on this interesting period, showcasing mostly works on paper and bronze studies for large-scale sculptures. The mechanization of the bodies depicted here echoes the anxiety triggered by the rapid advancement of new technologies in the twentieth century. Hinges in particular, as the art historian Robert J. Belton suggests, represent an illusion of flexibility and movement, even while in fact they are restricted and dependent on other connected parts. Finally, although the motif formally evokes a kind of dynamism, Etrog’s turn toward the hinge might also correspond to a darker twist in the artist’s life, which was cruelly upended by a 1967 car accident. This reading also finds support in a scene from Spiral: a modern take on a vanitas in which worms move through a mass of nuts and bolts. A similar sentiment of fatalism and of the proximity of death radiates from Etrog’s collaboration with Samuel Beckett on the artist’s book Imagination Dead Imagine,1969–77. Beckett writes in it: “No trace anywhere of life, you say, pah, no difficulty there, imagination not dead yet, yes, dead, good, imagination dead imagine.” However, in Etrog’s work death is always accompanied by lust for life. Take the opening scene from Spiral, where two ambulances are racing, one carrying a newborn, the other an elderly man about to undergo open-heart surgery. Or consider the fact that Etrog and Beckett’s book was stationed near the proudly upright sculpture Sun Life study, 1984, its vertical forms spinning from a circular base as if setting things in perpetual motion.